If bohemian weddings are the new rustic, then desert wedding venues are the new barns. This boho-meets-Western style is quickly becoming one of the coolest (and most Instagrammable) trends, and we can’t get enough. 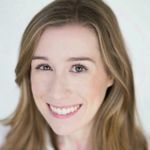 Whether you’re choosing to elope with your closest friends and family, or want to host a desert wedding because you and your S.O. are total outdoor lovers, this style is non-traditional, fun, and unexpected — in the best way possible. 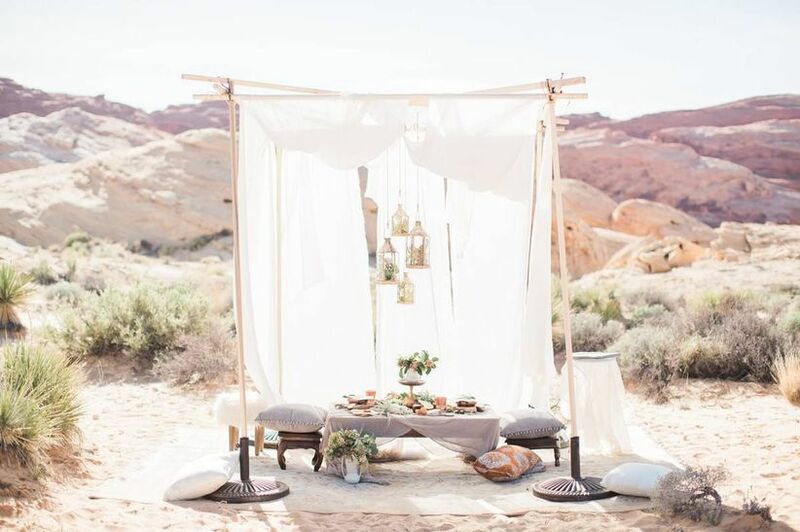 Keep reading to learn exactly how to pull off a gorgeous desert wedding of your own. Pick a vibe that works with your style. 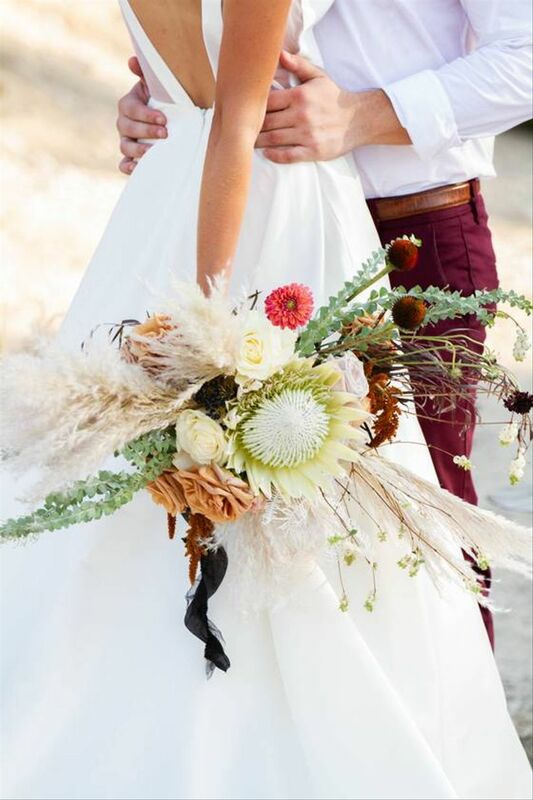 Desert weddings typically incorporate a lot of bohemian and outdoorsy details. 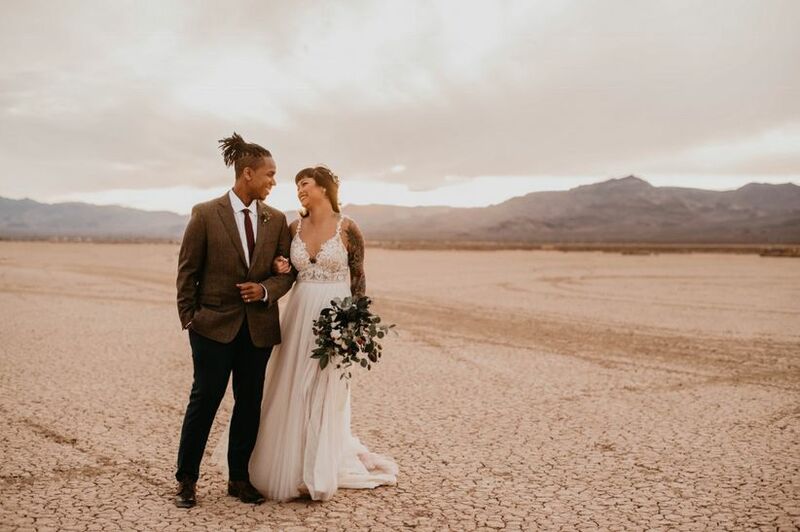 An off-the-grid location is perfect for couples who want a free-spirited, relaxed vibe on their wedding day — with a desert setting, you can choose to focus on the scenery of your surroundings without the need for elaborate décor. But that’s not to say that you can’t personalize the basics to your own style. If you’re feeling glamorous, add a grand floral arch or eye-catching aisle markers to your ceremony site. If rustic style is more up your alley, incorporate antlers, cacti, and wooden accents. Whatever your vibe, don’t overdo it with the décor. You don’t want to distract from those amazing desert views! Deserts are only found in the western part of the continent (sorry, East Coasters! ), so for many couples, having a desert wedding will also mean having a destination wedding. Las Vegas is located within Nevada’s Mojave Desert — the driest desert in North America — and there are plenty of breathtakingly rugged locations within a few hours of the Strip. Red Rock Canyon National Conservation Area is just 17 miles from downtown Las Vegas. This 200,000-acre area gets its name from the stunning red sandstone cliffs that reach up to 3,000 feet in height. 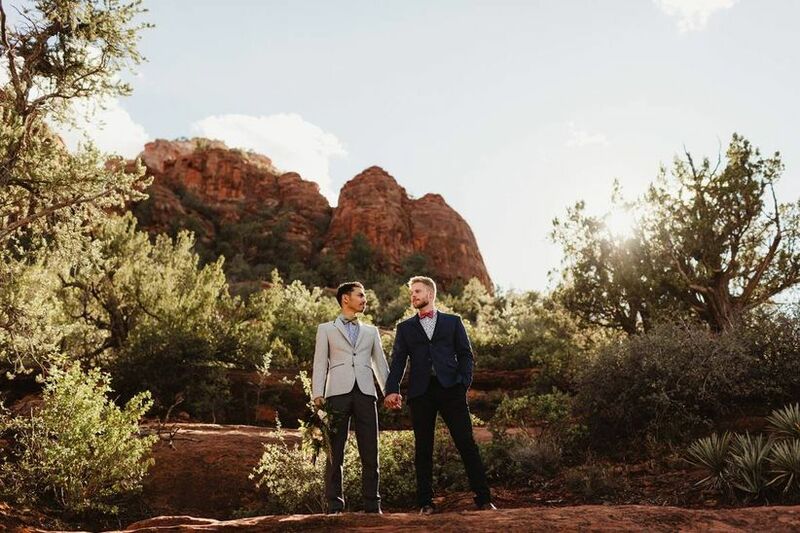 With a permit (you’ll need to apply at least 14 days in advance), you can get married at the picturesque Red Spring Picnic Area or Red Rock Overlook in Red Rock Canyon. Spring Mountain Ranch State Park is adjacent to Red Rock Canyon, and gets its namesake from the gorgeous natural springs and lakes located within. 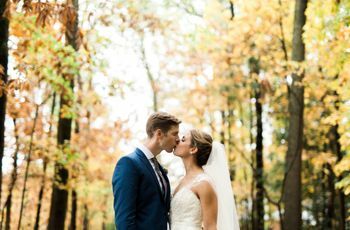 This park is also a working ranch, with a historic 1800s-era blacksmith shop, pioneer cabin, and outdoor theater that would all serve as interesting backdrops for your ceremony or wedding portraits. There’s also the Valley of Fire State Park, which is located about 50 miles northeast of downtown Las Vegas. In this park, you’ll find ancient petrified trees, petroglyphs, and the Seven Sisters, a group of towering boulders that are a popular backdrop for photos and desert wedding ceremonies. 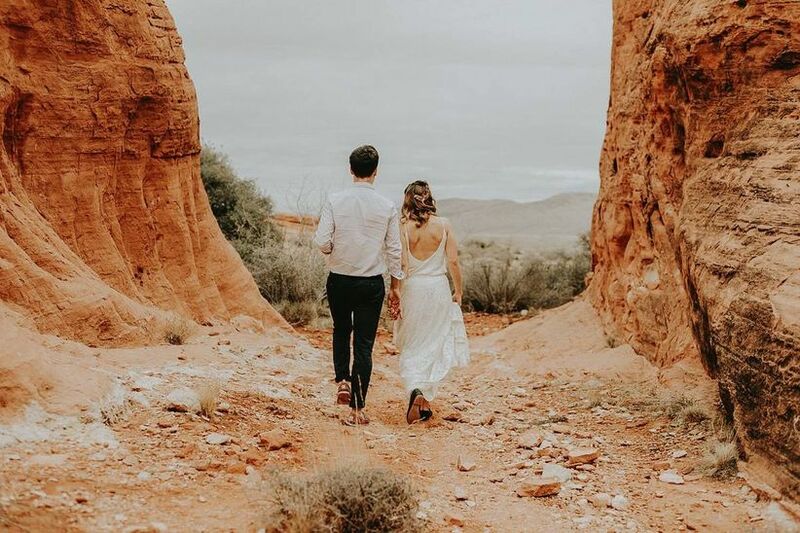 Other desert wedding spots near Las Vegas include Legends Ranch, Eldorado Canyon, Bonnie Springs Ranch, and the botanical garden at Springs Preserve, which is less than a 20-minute drive from the Strip. For the most dramatic desert views, plan a sunset ceremony. The horizon will come alive with vibrant bursts of colors (think purple, pink, blue, yellow, and orange) for a truly unforgettable experience. Get experimental with your wedding bouquet. As you’re choosing your wedding flowers, consider the warm and sunny weather that goes hand in hand with a Las Vegas desert setting. 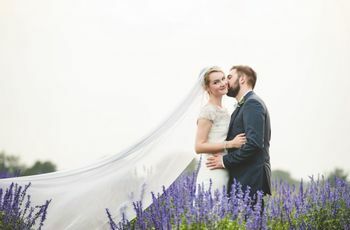 Both will affect how long your wedding flowers stay looking fresh and what flowers your florist should use altogether, since certain blooms can tolerate full sunshine better than others. Avoid wilting petals by choosing hardy options like sunflowers, proteas, chrysanthemums, and lilies. You can even ask your florist to incorporate flowers that are native to Nevada, such as lupine, thistle, daisies, sage, and phlox. Greenery is a stylish alternative to flowers when it comes to desert weddings. Trendy plants, such as succulents, scabiosa, poppy pods, and tillandsia, will thrive in Nevada’s climate. Use these plants as accents in your bouquets and floral arrangements, or use them sans flowers to play up a bohemian, nature-inspired theme. Let your guests know what to expect. While the end result is totally worth it, desert ceremonies tend to break away from many standard wedding traditions, likely leaving your guests with a few questions. 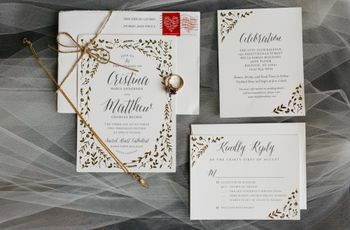 Provide them with as many details as possible about the logistics and timeline of the event, and make it clear that you’ll be getting married in the actual desert (because it’s not every day that someone gets married in such a unique location). 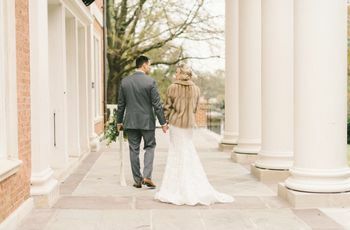 Be sure to address the major details, such as how guests will be transported to your ceremony location, what type of weather/terrain to expect, and whether or not they should wear outdoor-appropriate attire — closed-toe shoes versus high heels, for example. There is a good chance that this is the first desert wedding that many of your guests will have attended, so the more information you can provide in advance, the better! Most importantly, let your guests know that the party isn’t over after you exchange your vows! After you’ve said your “I do’s” in the desert, everyone can return to downtown Las Vegas for your wedding reception. There are dozens of places along the Strip that are perfect for celebrating with your loved ones all night long. From world-class resorts to art galleries, gourmet restaurants, nightclubs, and even secluded gardens, Las Vegas offers reception venues for every wedding style. If most people in your group are planning to stay in town for a few days before or after your wedding, create a list of the best Las Vegas attractions they can enjoy during their downtime. Provide hotel recommendations, restaurant options, and activities for every type of traveler (museums, spas, nightlife, golfing, shopping, etc.). Choose wedding attire that goes with the aesthetic. For a desert wedding, it’s best to keep your attire simple, comfortable and practical. Lightweight fabrics and loose silhouettes are ideal, especially if reaching your ceremony location requires a bit of walking. For wedding dresses, consider an A-line or sheath style. Fabrics such as lace, chiffon and organza are breathable and easy to wear outdoors. If you love boho style, dresses with bell sleeves or dreamcatcher details are two of our favorite trends. If you're wearing a suit, you can consider replacing the jacket with a vest or suspenders or skipping them altogether. Too many layers will be uncomfortable if you’re in the heat of the sun for a long period of time, and formal attire, such as tuxedos, will be out of place in the rustic desert setting. Look for casual pieces made from cotton or linen, and add your own personality with accessories, such as a patterned tie or unexpected shoes. Desert temperatures can become chilly after nightfall. If you’re getting hitched at dusk, be sure to have an extra layer on hand to keep you warm when the sun goes down. When it comes to desert weddings, there really is no right or wrong. One of the biggest elements of this style is taking the concept and making it totally your own, which is something that we’re definitely on board with. We can’t wait to see how couples embrace this unique trend!